Below you will see several areas where you can provide invaluable financial support. Call (828)283-0379 for more information on how to sponsor one of these areas, or email supersaturdayinfo@gmail.com. When families take a break from the professional stages, they head to the sights and aromas of the Festival Food Court. Here they'll find area youth organizations selling a variety of traditional festival fare to raise money for community causes. The Festival Food Court is located beside the Community Stage. Virtually all festival attendees converge on Melrose Avenue sometime during Super Saturday! Melrose Avenue is the heart of bustling activity with amazing street performers and kids’ activities offered free of charge throughout the day. At noon, the streets are lined with festival attendees eagerly awaiting the traditional parade with costumed children and festival performers. It is only with your gifts to Super Saturday that we can offer this special day to the children in our community. 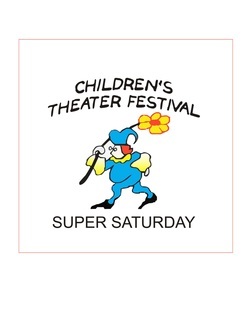 You can help ensure that the arts remain an integral part of our children's live for years to come by remembering Children's Theater Festival in your estate planning. For more information on giving, please contact us in one of the ways listed below. Thank you!